The Tarot has been around for centuries. Originally it was a card game played for fun, but over the years the cards took on beautiful symbolism and meaning as artists brought to life their own decks. These days the Tarot is a tool for divination, insight, and for our purposes… inspiration! 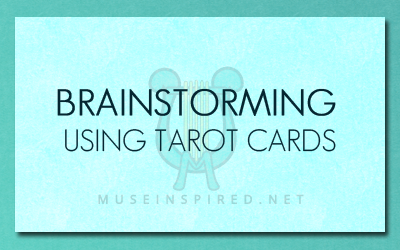 Using Tarot cards to tickle your muse is as simple as picking a card out of the deck at random. Each card often has a background story, symbolic imagery in the art, as well as traits associated with the card. You can draw from these things to develop the personality of a character, a struggle or consequence they may be facing, or even ideas for journey your character might take. Divide your deck in to 5 parts: The Major Arcana, Cups, Pentacles, Swords, and Wands. Shuffle the stacks separately and then draw one card from each pile. The Major Arcana card represents your character as a whole. Cups represents a piece of your character’s personality. Pentacles gives you where they are in live with their work or school. Swords will be the conflict or problem your character is currently facing. Wands can be your character’s goal and aspirations in life. Shuffle the entire deck and draw 3 random cards. The first card represents a major event in your character’s past. The second card is a conflict your character is facing in the present. The third card is an event that will happen in the future. Draw 5 random cards. Two cards are your character’s virtues. Two cards are their flaws. The final card is something that will change them as a person – good or bad. Draw 7 cards. The first card is your character. The second card is your character’s past. The third card is their present. The fourth is their current conflict. The fifth is a person who is strongly affecting their life. The sixth is their greatest fear. The seventh is something they need to get resolution. Extra fun tip: If you draw a card upside down – reverse its meaning! For example, if a card normally means someone is going to come in to some money, when its upside it would mean they are about to loose money instead. Don’t have a deck of your own? 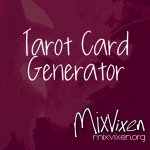 Use MixVixen’s Tarot Card Generator!